"We so rarely give thought to the machines that surround us, but just because we ignore them does not mean they don't have stories to tell. Monolithic factory machines might just hide a divine presence, robots from a forgotten war lay in wait in the sewers for a time when they can rise again, creatures of steel and steam patrol the skies, and a metal giant made for destruction learns emotions from a teenage boy. In these four tale, Derek J. Goodman shows us just what mysteries the mechanical world may hold." 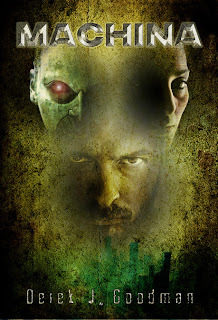 M-Brane Press presents Derek J. Goodman's collection of sf novelettes and novellas Machina. The book starts with the spectacular "Dea Ex Machina," which has been adapted as an opera for an upcoming production by the Crucible in Oakland California, and also includes the amazing steampunk novella "The Twister Sisters"; the loving homage to 1980's-era sci-fi and teen movies "Those Were the Days," and the stunning manga-influenced boy/machine love story "As Wide as the Sky, and Twice as Explosive." Mark Streshinsky, the librettist and director of Machine, the opera based on Derek's story, provides an introduction to the collection. The cover art is by Dan Galli. The book will become available in print and as an ebook from Amazon on April 1, but we are offering several direct-from-M-Brane pre-order deals starting immediately. 1) Buy Machina in print (trade paperback, 236 pages) for $12.95 (shipping included!). Get a complimentary one-year subscription to the PDF edition of M-Brane SF! 2) Buy the electronic version of Machina in either PDF, .prc(mobi), or .epub formats for $4.95. Get a complementary one-year subscription to the PDF edition of M-Brane SF! 3) Buy Machina together with Cesar Torres' The 12 Burning Wheels (both in trade paperback) for only $14.95! Or with Ergosphere, ten stunning stories from the pages of M-Brane SF, for $15.95! Shipping included, as well as a complimentary one-year subscription to the PDF edition of M-Brane SF!